I didn’t even know what to do with me. I was boarding a plane to watch my father die. I was getting ready to change my entire world, even though I didn’t want any piece of it. My parents were “old” when they got married. My father was 27, my mother 24. Back in 1987 that was old. Now, myself at 24, I keep thinking about what it means to be in love. And having never truly experienced it, I only know of the love that was built around me. I grew up in a two-parent, two-child household. It was pretty normal. Nothing stuck out about my family — blond-haired, blue-eyed kids, parents with steady jobs and a two-car garage. I didn’t know how spoiled I was to have parents that were married and had never been divorced. I didn’t have half siblings. I didn’t have stepparents. I just had Barb and Bear. My parents met while working at a restaurant. Not just any restaurant, it was a pizza joint. All throughout my childhood my parents always talked about that. Eventually they opened their own restaurant together. They’d been married 27 years when my father died. I watched my mother as she lay next to my father. She’d moved his hospital bed as close as it could get to their bed. She put pillows and blankets in the small crack in between the two beds so she could be as close to my father as she could. He’d begun wasting away. Eighteen months of cancer had finally taken its toll on his body. Instead of being nearly 300 pounds, my father was probably down to 100. He was a shell. He couldn’t talk. He could barely hear and see. He wasn’t the father that I’d grown to love over 24 years. 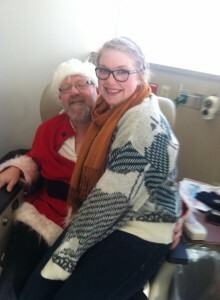 My father dressed as Santa Claus during one of his chemotherapy sessions back in 2013. But my mother did everything in her power to make sure that he was going to be OK before he died. She was with him almost 24 hours a day. She barely slept. She barely ate. She just wanted to help him — rid him of the pain he’d been dealing with for almost three years, rid him of the stress of cancer that’d he’d been battling. She was curled up next to him. She didn’t see me watching from the hallway outside of their bedroom. He had hours left; we both knew it. He wasn’t going make it through the night. Only five days earlier I called to talk with my mom. I didn’t call her talk about anything serious. Just tell her how a doctor appointment went and see how she was doing — normal mother-daughter stuff. Then she told me. I knew then he’d be dead by the weekend. I sat in my car and sobbed in the parking lot of a grocery store. I called my boss and asked for the weekend off. I remember the day I found out about my dad’s cancer. I’d just come home for fall break. I was a senior with just months left before graduation. I was so excited for that possibility. So was my father. He was one of the big reasons why I chose to attend Drake University over any other option that was given to me. I remember when he took me to meet my admission’s councilor, how even though the night before a huge snowstorm shut down the campus he was still enamored with it —possibly more so than I was. We talked about it on the car ride home. He was sold, so therefore I was. He proudly wore every piece of Drake gear I could get him. Even in his coffin we put a small handkerchief in there that was Drake blue and had bulldogs on it. He was more proud of my education then I was. I should have had him visit campus more. He never told me. I don’t think my father ever once told me he had cancer. I’m almost positive it was just this mythical being that we both knew and understood, but didn’t want to acknowledge. I’d barely been home for 20 minutes when my mother told me. “It’s cancer, isn’t it?” It was the only logical answer. Something changes in you when you find out a parent is dying. When you’re in your 20s you think that your parents are going to be around to see you grow up and have kids. You think they’re going to be around to go to your wedding, to help you move into your first home. 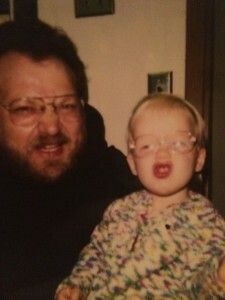 Me and my father, circa 1993 when I got my first pair of glasses. I knew that future was never going to be in the works for me anymore. I was angry. I was sad. I didn’t quite know how to negotiate those feelings within myself, and I still don’t. I think any young woman would be angry to know that her father won’t be able to give her away at her wedding. He won’t be able to get to help raise her children. He won’t be a grandparent. I think most of all, it’s like losing a best friend, a person who has been here for you every step of the way. I went through my last year of college assuming my father wouldn’t see me graduate. Until I walked across the stage with him in the audience, I just kept bracing myself for the worst. As soon as I graduated it was just a waiting game. Trying to see when it would happen, placing mental goal posts — He just has to make it to his anniversary. He just has to make it to his birthday. I hope to God he can make it to father’s day. The week before his 55th birthday he went into the hospital. He had intense pain. The cancer had been slowly spreading, and now it was in the process of taking over his entire body. We knew it was just a matter of weeks at that point. After he left the hospital my mom put him into home hospice care. No more chemotherapy. I don’t know if I cried when she told me. I’d cried so much over those 18 months. I’d wake up in the middle of night after having a dream that I died in a car wreck before he died. I’d write in my journal about how scared I was for when he died. It all ended the same, me in bed crying. My grandmother died when my mom was 11. “I don’t know, I only had so many memories. You have a decade more than I did when my mom died. It’s not fair to you. As I’d grown newly accustomed to, my mother and me just sat on the couch and cried. It’d been hours after the morticians came to pick up my father’s body. We’d made all of the phone calls. We’d done our last minute planning. We decided to try and get some sleep. I didn’t want to go down to my childhood bedroom so I just grabbed a blanket and tried to sleep on the couch. I couldn’t stop myself. I just started crying. My mother heard me and came out to comfort me. We both just sat and cried. She lost the love of her life. I lost the man that gave me life and my number one fan. We’d just started to hit our strides in terms of father-daughter relationships. My mother was right. It wasn’t fair. And from what people tell me it doesn’t get easier. The pain doesn’t go away, it just subsides. It hides out in the back of your mind until it hits you. It’ll hit you at the worst times. It’ll hit you when you’re out with a group of friends and someone makes a comment about what their dad is doing this weekend, or when someone makes a comment about how annoyed they are by their dad. You wish you could be annoyed by your dad. You miss the annoying things he did — like buy you a fire proof safe as a gift (but you’re also totally thankful for the safe now that you think about it). I still forget that he’s dead. On days where I’m having an especially hard time I still find myself dialing his number only to stop midway through, realizing he’s never going to pick up the phone. I find myself constantly wishing I could talk to him, be able to share my day with him like I used to. Sometimes I even just miss sitting in silence with him. 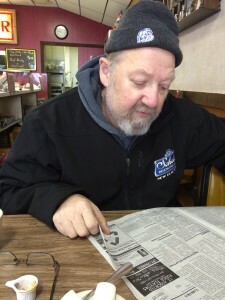 How in the mornings when I’d visit him back in Minnesota we’d go get breakfast together and read the paper. He’d take his glasses off and read the local news. I’d put the paper as close to my face as I could and read whatever section he handed me. He paid attention to the news so we would have something to talk about together. Even in his final hours I sat in the bed next to him, my laptop open to The Star-Tribune and I picked out articles to read him. My mother and I made sure that one of us was in the room with him at all times; mostly because we didn’t want him to be alone, but also because he didn’t want to be alone. If I left the room and my mom wasn’t there, or if my mom left and I wasn’t there he’d start to groan and yell. The cancer had spread to his tongue so he couldn’t speak, but we knew he wanted us to be there. When the priest came to deliver the last rites I knew it was merely hours before I’d no longer have a physical father. My father was draped in a blanket and as Monsignor walked in, I could see the look of concern on his face. He knew what he was about to do. He’d done it many times before. In the background my father’s favorite music played. I’d switched on a streaming radio station that played only music from the 1970s, the music that my father grew up listening to — the music that I’d hear blaring in our garage when I was young. The music I’d hear him sing along to in the car. My father’s best friend once told me the music that defined my father was the Southern type of rock ‘n’ roll I now crave — the powerful guitar riffs that rock your soul, the lyrics that don’t quite matter. The priest looked at me and put his hand on my shoulder, a gesture I’d grown accustomed to through years of Catholic masses and Wednesday night religion classes. It was also a gesture I’d grown to hate. It was a way of acknowledging pain that couldn’t be taken a way. It was a way of trying to assure you that everything would be OK when you knew that nothing could be OK. It was a way to silence you. Priests, as you should know, are usually pretty prepared for things like this. They come equipped with Holy Water, rosaries, prayer cards, an annotated bible that they’ve been carrying for years. I learned that early on, even the most liberal of priests were ridiculously prepared, but for whatever reason, on that day the priest couldn’t find his rosary. It wasn’t in his coat pockets. It wasn’t in a pocket in his vest, or let alone his slacks. We counted the rosary on our knuckles. All the “Hail Marys.” All the “Our Fathers.” My father yelled the entire time. He didn’t sit still. The priest looked at me. He looked at my mom sitting in the bed next to my father. Then her cell phone went off. She looked at me. I took care of it. I’d become the communicator that week. I was the one calling, texting and emailing people. I was the one writing updates on his CaringBridge page. It was her best friend. I ignored the call. Then, not even three “Hail Marys” later her phone goes off again. A few “Our Fathers” later so did mine. I’m sure there’s a layer of Hell for people whose phones go off during the last rites — Catholic Guilt tells me so. But, it was refreshing, and something that we laughed about. I’d later find out from my father’s best friend that “Tiny” was his nickname for awhile. His best friend almost cried when I told him “Tiny Dancer” played during the last rites. It almost made me believe in God again. My father died minutes before 4:15 a.m. on April 11. I was in the room when it happened. My mother and I held his hands. We felt him take his last breath. I called the time of death. We sat in silence for a long time. There was no death rattle like we’d been told. There was no trembling, no final gasps. It was almost as if he just took one long breath and then decided it was time. 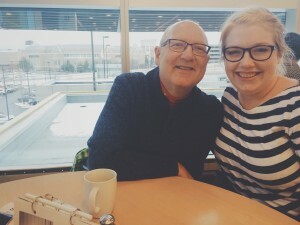 A breakfast father-daughter date sometime in 2014 before I graduated college. “Lauren, what happened to the music?” The streaming radio station we’d been playing since his last rites hours before had stopped playing. We’d tuned everything out. I realized in that moment that it quit playing almost as soon as my dad died. The last song that played was “Let It Be” by The Beatles. That would have pissed my dad off. He hated The Beatles — something he passed down to me. But it made sense, in that moment. We had to just let it be. My younger brother wasn’t home when my dad died — he was at work. We made sure to get my dad’s body out of the house before my brother came home. He wouldn’t have been able to handle that. I’m surprised I handled it. When the morticians came to pick him up, it was almost as if old friends had met again. When you grow up in a small town you know everyone. On multiple occasions the mortician had actually bought me beers down at the bar my father frequented. My dad bought the fridge that resides in our garage from the funeral home (we decided to not ask what was kept in it). It was almost comical to watch the morticians take my father’s body away. At his prime my father was a 6-foot, 280-pound man. He played football throughout his younger years. He coached in his 20s. He wasn’t a small guy. But the cancer took that away from him. He was so small. There was no fat on his body, you could count almost every bone in his body. His elbows were as sharp as the knives we had in the kitchen. Yet, the morticians still dropped the gurney when they took him out of the room. It was a sharp angle in a small hallway. I laughed when the gurney hit the floor. My mom looked at me, almost to disapprove, but then joined in laughing. I think we needed our humor in that moment. When it came time to make the calls, I offered to call my uncle — my father’s only sibling. I called him first. I didn’t call my grandparents, I just elected to call my uncle. I cracked. I started sobbing. I couldn’t say it. I couldn’t tell him that my father had died. I wailed through the phone. I don’t remember much after that. I just remember shutting my father’s flip phone and collapsing on the floor of my parents’ kitchen. I don’t know how long I stayed there for. It could have only been a few minutes, but it felt like forever. When his wake and funeral came almost a week after his death, I’d dealt with much of what I believed to be grief. I knew what I was getting into. I wrote his obituary. I picked out his clothes. I proofed his programs. I drank. I did everything I was prepared to do. But I wasn’t prepared to see the heartbreak in my grandfather’s eyes when he looked at his son in a coffin. My father was the youngest of two boys. He was never that close with his family. We always visited for holidays, called once in awhile, but they always seemed distant. My biological grandmother had died years before when I was in middle school. I remember the night we got the call. My father was driving us back from another relative’s house. He answered his cell phone and pulled over to the side of the road. I’d never heard my father cry like that. It was like a different person was in the car with us. I was 13, maybe 14 at the time. I’d been to so few funerals I didn’t know what to expect. I don’t know if my father ever grieved my grandmother’s death. We never talked about it. For a long time we didn’t talk about much. Once I went off to college we became really close. He meant the world to me. And seeing my grandfather almost collapse at my father’s coffin still haunts me. My grandfather has always been a stoic man. Emotions aren’t a strong suit for the Horschs. I don’t know if it ever will be. But at that moment, I just hugged my grandfather, I could feel him shaking in my arms. He never got to say good-bye. He couldn’t. He couldn’t look at my father in that hospital bed. He couldn’t see him wasting away. “Donnie, thank you for giving me your son,” my mother said to my grandfather through sobs. Now, five months and 11 days since his death, I find myself wondering what it truly means to be “grieving.” I save moments in my life. Moments I think would be good to share with my father. I write them down. I keep them in a notebook. I keep them locked up. But I also find myself closing off to a lot of things. Mostly to being vulnerable. The other day while at work during an interview a source asked me if my father was still alive. I almost started crying right there and then. Hiding grief is easy until a stranger asks about it. “It’s not OK,” the source told me. I told the source how my father and I had planned to go to Germany someday and make the same trip he did right before he proposed to my mother. A trip that helped change his life. It was a trip we always wanted to take together. He wanted to show me his favorite Biergarten. I wanted to translate everything for him. It was going to be our thing. We’ll never get that opportunity. And for a while, I was OK with that. But having these regrets at 24 remind me that you only have so many years. My dad only had 55. And I hope when I’m 55, I’ll be just as great as a person as he was.